Russia is quietly expanding its influence in Latin America as the Obama administration disengages from the region, critics say. 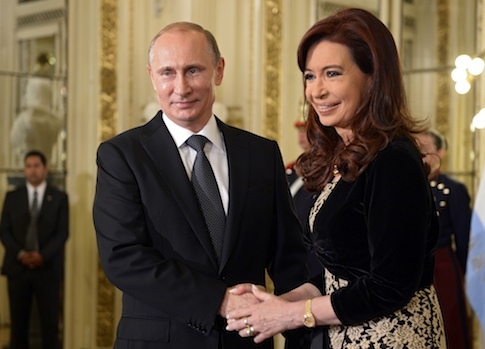 Russian President Vladimir Putin signed a deal on Saturday with Argentine President Cristina Fernandez de Kirchner to help build the third reactor of a nuclear power plant in the country, the New York Times reported. Russia also aims to build bases in Argentina for its satellite system and use Russian planes and helicopters in the part of Antarctica that is claimed by Argentina. Putin traveled to the region over the weekend to attend the World Cup final in Brazil and officially begin preparations for the tournament’s 2018 edition in Russia. He is also expected to sign a nuclear agreement with Brazil ahead of a summit for the emerging market nations known as the BRICS—Brazil, Russia, India, China, and South Africa. Additionally, Putin cemented deals on Friday between Russian and Cuban energy companies and waived 90 percent of Cuba’s Soviet-era debt. Jose Cardenas, a former George W. Bush administration official and assistant administrator for Latin America at the U.S. Agency for International Development, said in an interview that Russia has enough energy resources in its own country without having to partner with countries in Latin America. The recent agreements are more about "self-congratulating and aggrandizement," he said. "On a geopolitical scale, the side obviously with the United States and its allies in NATO overwhelms whatever Putin can assemble on his side of the scale," he said. "It’s his attempt to pretend that Russia can project its operations into the Western Hemisphere—just like the United States can project its power into Central and Eastern Europe," he added. "There’s a lot of sizzle and very little steak." However, Cardenas said authoritarian governments in Russia, China, and Iran view Latin America as a "political vacuum" in light of less U.S. engagement in the region. The most recent example is in Central America, where the administration and lawmakers have reduced security assistance, he said. Tens of thousands of unaccompanied minors have now fled violence in their home countries to seek asylum in the United States. "Latin America is not even in the top 10 of issues of perceived importance by this administration, and countries like Russia, China, and even Iran are certainly exploiting those opportunities," he said. Rep. Ileana Ros-Lehtinen (R., Fla.), a Cuban-American lawmaker and former chairwoman of the House Foreign Affairs Committee, also expressed concerns about Putin’s actions in a statement to the Free Beacon. "During his trip, Putin met with the Castro brothers, the worst human rights violators in our hemisphere, and forgave some of Cuba’s debt, signed a nuclear agreement with Argentina, and reaffirmed economic cooperation with Nicaragua," she said. "Russia continues to undermine our foreign policy objectives throughout the world and its presence in our own hemisphere can destabilize the region and is meant to thumb its nose at the United States." Putin’s foray into Latin America comes after Russia’s annexation of Crimea in March. That action, widely condemned by international observers, helped the Kremlin secure control of vast oil and gas reserves in the Black Sea potentially worth trillions of dollars. Argentina was one of the few nations to back Russia in the Crimea dispute. Kirchner criticized the international community for condemning the successful referendum in Crimea but not one last year in the Falkland Islands, where residents of the British-held territory lying off Argentina’s coast voted to remain British. "Argentina often has its own opinion … but it is always one of its own, and is a sovereign one, which is utterly important and cannot be often seen in the modern world. And we highly appreciate that," Putin said over the weekend. Argentina also faces another debt crisis as investors sue the government for the full repayment of sovereign bonds that the country defaulted on in 2002. Marine Corps Gen. John Kelly, head of U.S. Southern Command, raised concerns about the increased presence of Russia in Latin America in congressional testimony earlier this year. Kelly said he observed a "noticeable uptick" in Russian power projection last year, including a visit by a Russian Navy fleet to the region and the deployment of two Russian long-range strategic bombers to Venezuela and Nicaragua as part of a training exercise. "It has been over three decades since we last saw this type of high-profile Russian military presence," he said. "While Russian counterdrug cooperation could potentially contribute to regional security, the sudden increase in its military outreach merits closer attention, as Russia’s motives are unclear," he added. This entry was posted in National Security and tagged Argentina, Nuclear Energy, Russia, Vladimir Putin. Bookmark the permalink.